SpeedSurfing News: Camper van and Windsurf van conversion, Bed and Kitchen complete. 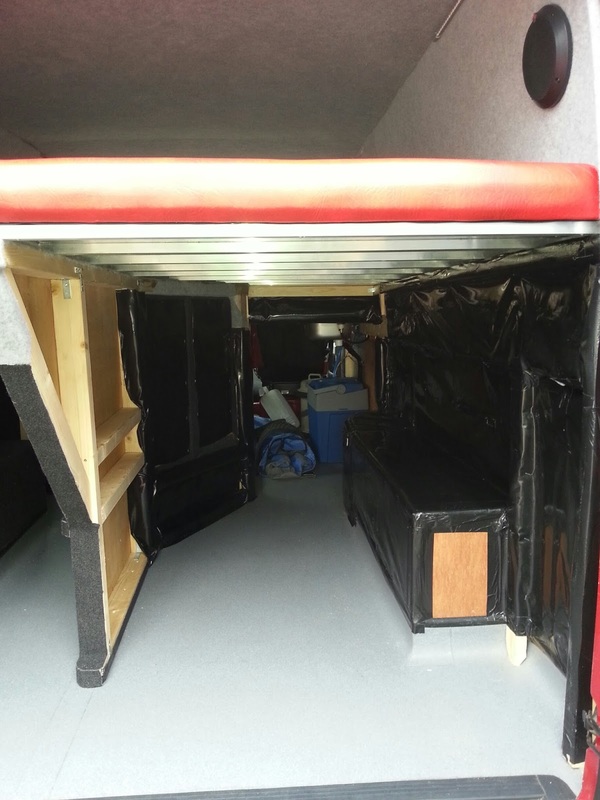 Camper van and Windsurf van conversion, Bed and Kitchen complete. I can now see light at the end of the tunnel. All there is left to do are the front cupboard/seat, side cupboard, overhead kitchen storage, curtains, trim above the sliding door, kitchen front with lift up table, final trimming of paintwork, useful rail above cab area.....when I put it like that it seems a lot but these are not crucial jobs before I go away for a week. This weekend I wired up the tap and connected the gas to the stove. 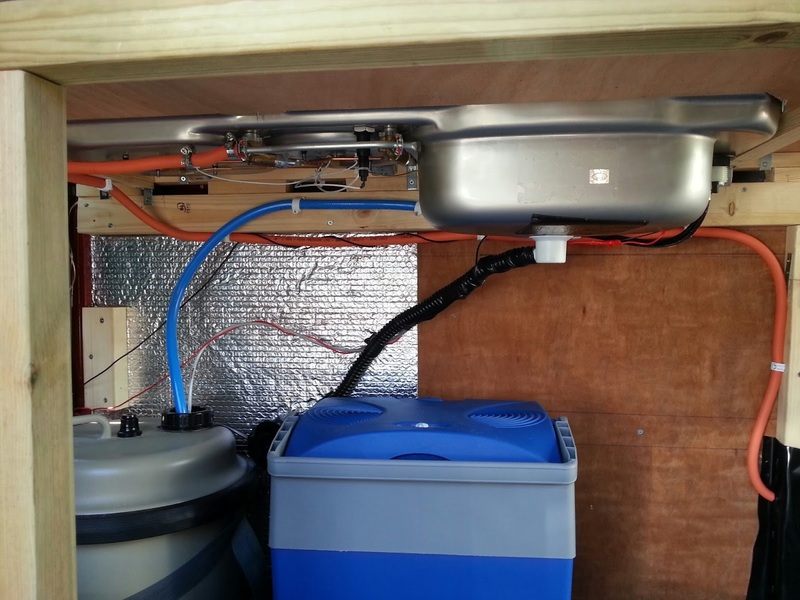 I carefully made sure all wires and tubing were secured well. The tap for the sink was a pain, with 8 different wiring combinations and no way of telling which wire did what due to a mismatch of colours on the sink and pump I just had a go and got it right first time. The pump wires are interchangable with no difference in flow. I also secured the water roll with a buckle strap stolen from an old sail bag, and used another one to make a more secure fixing for the gas bottle. Drilled another hole in the floor (now 3 in total) for the waste pipe which goes out next to the second drop out vent for gas. After Kat saw the primer on the worktop she decided she wanted the worktop grey and not black. So Friday evening I was looking for car paints in grey, then realised I had an offcut of Altro flooring. I know this is not ideal but it is a really good finish and goes well with the rest of the interior. Cutting the worktop was fun, with limited instructions I ended up using a lot of the techniques I teach in maths (bisecting the line, bisecting angles, and other loci). This did not take much time at all, the longest job was trimming round the edge with the provided rubber....it fell off more times that I can remember, I would get one bit on and the other end would fall off. Saturday night I sat at the sewing machine and made the bed covers, only to realise that I was about 5cm too short to do all 3 sections with single pieces. So chose to do the most used smaller piece properly with side sections. I made it up as I was going and think it has turned out well. 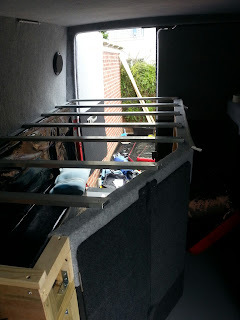 Today I made the aluminium supports for the bed, bought a file and smoothed all the ends, then trimmed round the visible edge with some 1cmx1cm pine covered in the grey veltrim, now none of the supports are visible. Here is where all my sleepless nights were made into a well fitting product. The bed works perfectly and fits together really well. 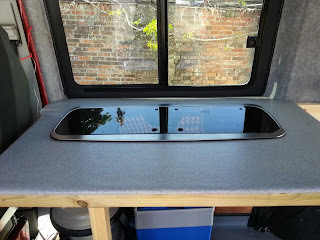 The sides of the van are sloped ever so slightly, so at bed height the centre support is 2cm closer to the wall than at the wheel arch box height. This means that the two loose pieces of bed can be locked into place lower down creating a seat looking in or out of the van. All I need to do is make a support for the back rest. Finally I finished off today trimming where the bed meets the kitchen worktop. It now looks seamless and I will upload a photo of the completed bit, this is one of the bits I have done on the spur of the moment that I am really happy with. Many times I have needed a break from the more complex stuff and needed to do something without thinking that is simple. Over this time I have lined the Windsurf kit area with 1cm firm foam, some pipe cladding and very thick PVC. There are still a couple of bits left to do but you get the idea from the pic. Anywhere that would attract the nose of a board is well padded. Ultimately I will put racking in here, but as yet have not decided which way works best. It fits 3 boards from 79cm wide down to 59cm, these are my most used, I only load my smaller boards if the forecast is giving 25knots plus which is rare at the moment. Of course I then dont need my 79cm wide board. 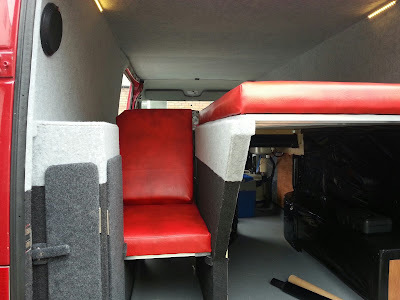 Sails on bottom, boards over the sails - footstraps facing down at about 30deg off vertical, nose bending round the curved gas box at the end of the wheel arch into the kitchen area, ending just where the sink starts. Booms either with sails or at an angle with the boards (I tend to leave the extension on the booms so with the sails works better. Boards on floor on rails (will have padding under). Sails in a rack over the wheel arch and smaller sails on a false floor with the booms above the boards. Of these 2 options I prefer the first I think. I will live with it for a bit and make my decision as I go. There will be a box built for kit where you can see the untreated part of the wheel arch. Also I have left the rear mid section untreated as I may use this for fins and extensions with some netting, time will tell for this. All I can say is there is a huge area for kit considering how much camper van is left for living. 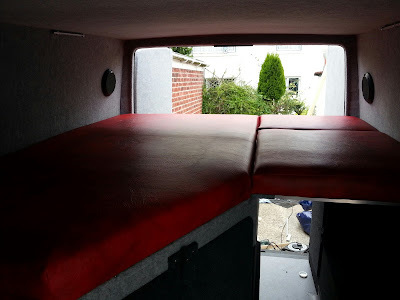 It is looking good, I can't believe now that I have done all this from scratch, the only ready made things I have used are the Smev Sink/Stove, Fridge, and an original Silver Screens shade for the front. I also realised today that I have only thrown away one half full bin bag of waste and will only have another half bag full of offcuts (small) of carpet and bits of wood (will probably keep these for a beach camp fire when its all done).